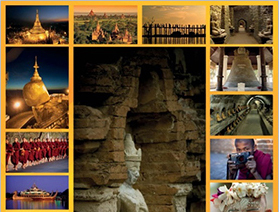 On arrival you will be welcomed by Myanmar Shalom tour guide and transferred to your hotel for check-in. Drive through downtown to explore the city centre and its fabulous mix of architecture and sites. The streets are filled with historical buildings many of which have a faded colonial charm not seen elsewhere in Asia. You’ll start at the post office – a lovely historic building- and to Sule Paya in the middle of downtown, passing by Strand Hotel, Mahabandoola Garden and Independence Monument along the way. Then visit Little India and Chinatown – stop to greet the vendors and let them introduce you to their wares – some familiar, some exotic. Photo stop at the Karaweik Hall royal floating barge.Nothing will prepare you for Shwedagon Pagoda, with its glittering gold stupa. At the pagoda observe local pilgrims and monks offering their devotions and enjoy the amazing sunset view at Shwedagon pagoda. Morning flight to Bagan. Begin our exploration of Bagan by visiting a busy local market and gain an insight into the bustling market atmosphere in Bagan. You will spend the day exploring the architectural masterpieces of this amazing town by visit to a diverse selection of the most important pagodas and temples. Also visit a local lacquerware workshop and watch men and women ply their craft using traditional methods. In the late afternoon climb to the top of the Temple for sunset views. Sit back relax and be amazed by the beauty of Bagan as you watch the sun slowly set behind the ancient Pagodas. Optional Balloon over Bagan for sunrise: Today you will have a unique opportunity to see the ancient city of Bagan from a different perspective. From a hot air balloon, you will get a magnificent aerial view of thousand-year old pagodas and temples and rural villages nestled along the Irrawaddy River as you glide aloft for about an hour. A champagne celebration concludes our adventure. Return to the hotel for breakfast. Around noon you disembark the luxurious Anawrahta, berthed at the quay of Bagan. After a warm welcome by our staff offering some refreshments you move into your “home” for the next days. Enjoy a leisurely lunch as the ship sails towards Pakkoku. Pakkoku is an old trading town on the western riverbank of the Ayeyarwady. Right before the arrival you see the longest bridge of Myanmar (Pakokku Bridge). On shore the tour takes us to some of the small industries in this area, such as a cheroot-rolling factory and a producer of ‘Burmese slippers’ (“flip-flops”). Local handicraft vendors try to make their living with it. A visit of the thriving market gives us an insight of the local goods and trading. Pakokku is also well-known for the production of Tobacco. If you like to buy some Burmese cigars, this is the place. We continue touring to the Shwegu Temple. This temple features incredible, intricate carvings made from rare Yamanei wood. It also houses a unique Buddha image seated on a lotus throne. Back on board lunch is served and Anawrahta continues her journey, eventually arriving at the utmost highlight of this journey – Mandalay. The ship will dock at the Mandalay pier at the early afternoon (approx. 2PM). As the evening approaches and the Burmese sun immerse everything in a golden light a special event will take place at the Kipling’s Bar. Dress up in style as we send “A toast to the past” during a British club gathering where gents may whiff cigars and ladies sip on tasty gins with tonic. Share some tales of the old (British-Burmese) days. Isn’t sometimes the time to lose time. For early morning risers there is a special opportunity to participate at a yoga session on the sun deck. Strengthen your muscles and ease your mind by merging with the Ayeyarwady and its therapeutical slow flow upstream. The next stop is Yanderbo. While having breakfast the ship passes the confluence of the Ayeyarwady and it’s greatest tributary, Chindwin River. We arrive at the quiet, small riverside village of Yanderbo. An unique and fascinating gem of a village where in 1826 the King of Ava signed the Treaty of Yanderbo, signaling the end of the First Anglo-Burmese war. Nowadays the villagers produce a type of water pot which is reputed to keep water cooler than pots from anywhere else in the country. Anawrahta’s broad-knowledge guides will offer you the explanation to that. Back on board a delicate lunch buffet awaits you. The ship continues its journey northwards. Gaze on the river banks of this eternal stream from your bench on the sun deck or alternatively, a spa treatment would have the same recreation effects. In the afternoon we learn more about some of the long lasting tradtions (Longyi and Thanaka demonstration). A fascinating presentation about the history and culture of Myanmar follows afterwards. Before dinner you may like to enjoy one of our various treatments in the Thanzin Spa. Dinner is served at the Hintha Hall. If you feel like it you can take a seat at our open air cinema under the stars on the sun deck showing a classic movie (depends on weather conditions). In the morning our yoga class helps to get in the right form for a day. Back on board a feast of a lunch buffet is served and Anawrahta continues the cruise northwards, eventually arriving at the utmost highlight of this journey – Mandalay. Take some time to observe the beautiful Sagaing Hills with loads of scattered pagodas while the ship is passing by. We will dock at Mandalay at the early afternoon (approx. 2PM). After breakfast, fly to Heho, gateway to Inle Lake. Known as the most beautiful lake in Myanmar, Inle Lake’s calm waters are surrounded by high hills and dotted with floating gardens and stilted villages. Then drive to NyaungSh- pick up boat & transfer to your hotel for check in. Enjoy the full day tour by boat in Inle lake. The five Buddha images of Phaung Daw U Pagoda are the holiest in Inle Lake. Next, visit a unique Monastery on the Lake Nga Phe Kyaung, near Ywama village where the local Monks have trained the cats to jump through hoops, it is now affectionately known as the jumping cat Monastery. Proceed to Nampan village and see local cigar [cheroot] making and canoe carving. Continue sightseeing in Inle Lake, maneuvering by boat though long, scenic channnels where you can watch the farmers cultivate their produce in “floating gardens”. You will visit the fascinating village of Indein, with it’s complex of ancient shrines and stupas and walk though exotic colonnades of stairways and shop stalls. You’ll visit the “long neck” tribal women, and weaving and craft villages perched on stilts. See the lake’s unique “leg rowers” – the Intha people row standing up with one leg wrapped around an oar. It is a feast for the senses and a photographer’s dream. After breakfast, transfer to airport for International departure flight. There are many different cruise lines that we work with depending on the budget range and schedule you will be able to choose different cruises.